As I said a while ago before I got sidetracked by those pesky French Alps, this post will be mostly to do with my breakfast. In the spirit of honesty, here is a website representation of how relevant this post will probably be for you, the reader. But I guess if you happen to live in London, or will be visiting any time soon, this may be of some use to you if you enjoy a breakfast that is SO GOOD it makes you think “well, it’s all down hill for the rest of the day.” And I do. I’m not going to tell you the name of the place straight away, rather, what does this make you think of? I can’t even pass this off as an ‘arty’ photo. 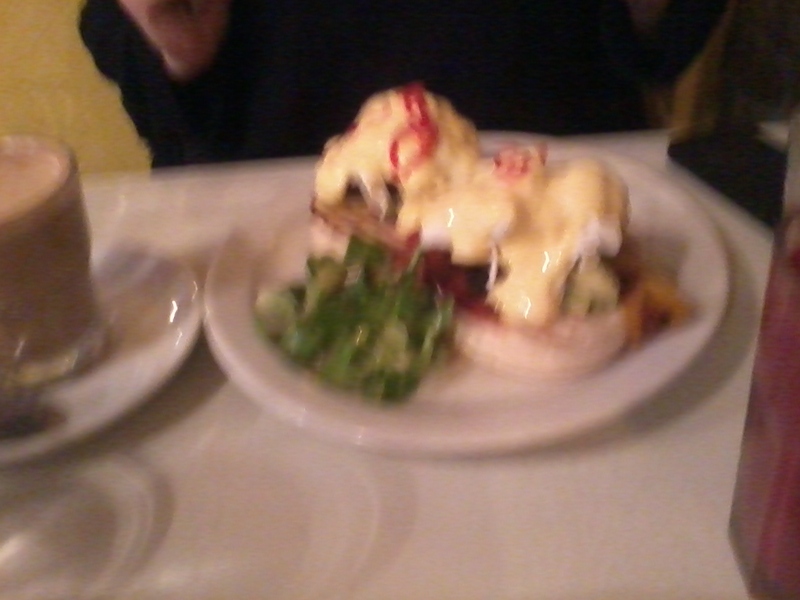 It may be difficult to make out, but this is a spectacular creation called the ‘Huevos Al Benny’, a very Spanish twist on regular eggs Benedict. Accompanying the usual poached eggs, English muffins and Hollandaise sauce are generous amounts of chorizo, peppers and guacamole. I’ve since been back to The Breakfast Club and had a more traditional cooked breakfast (plus a side of pancakes), but I can not go past Huevos for muchos el flavour. If these sorts of things don’t take your fancy, the menu is extensive. Both times I’ve been I have found at least five things on the menu I’m torn between, and I haven’t been disappointed with my choices. Importantly, the coffee is good quality and well made, and the smoothies/juices provide a welcome hangover aid. Even though it runs the risk of increasing the queue, and hence my waiting time, I should probably tell you where they are located. I must say that having visited two of their five locations (Spitalfields and Soho), they don’t feel like a chain. They still maintain personality and excellent quality in what they serve, and you can find them here. Until next time, have a great morning. Enter your email address if you want to be notified of a new post. Lazy. Thought I Left, Didn’t You? Nah You Should Know Better! My Real Merry Cheesemas: Read Earlier Posts If You Don’t Get It! In short: an attempt to humourously chronicle the thoughts and things I experience on my journey. No offence intended (other than on the grounds of general decency because of bad jokes).